As many of my regular blog readers know, I am passionate about wine. But recently, I have been exploring beers as well. Once or twice a month, when we have casual get together with friends or family and casual food is eaten (pizza, etc. ), beer just seems to hit the spot. 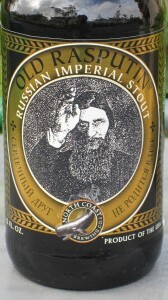 Recently I came across Old Rasputin Imperial Stout Beer by accident. I have to be honest, most beers just don’t “do it” for me. Perhaps it is because I am used to the complexity and sophistication of wine. But this beer is really something. It is made in Fort Bragg, California and is NOT where Fort Bragg Army base is (it is located in North Carolina). Fort Bragg is located in Mendocino County, north of Napa and Sonoma. This beer is complex, with aromas and flavor of coffee, chocolate and brown sugar, with a warm finish. Most imperial stouts have a bitter finish, but this beer is balanced. I describe it as a pleasant bitterness, almost earthy. It has 9% alcohol by volume, which is almost twice most pale beers, but still less than the 12-14% alcohol content of most wines. I also like the cover: very dark and mysterious. I have not been able to find a translation of the Russian writing on the bottle. Even Google search failed! So if anyone speaks Russian, please let me know. After doing some research, I found this beer has been consistently rated 95 or higher (out of a 100 point scale) and has been rated as one of the best beers ever made. The great thing about beer is its quality to price ratio (QPR). One can purchase a four, 12 OZ pack of this beer at Total Wine and More for less than 8 dollars. In other words, 24 OZ (equivalent to a bottle of wine) of this beer will set you back only 4 dollars. I challenge anyone finding me a 4 dollar bottle of wine which has rated 95 points or higher. If you do, please deliver it to me riding a unicorn! Stout beer should be served much warmer than pale beer, around 58-65 degrees Fahrenheit, otherwise the flavors will be muted and the beer will taste bitter. So next time you desire a beer, pass up the insipid, commercially made Coors and Budweiser, and purchase some Old Rasputin. Michael A. Jazayeri, M.D. is a board certified plastic surgeon with over 13 years of experience. His office is located in Orange County, California. To schedule a complimentary consultation, please call 714-834-0101. Starting a Colony on Mars Sounds Cool- But Have You Read the Fine Print?